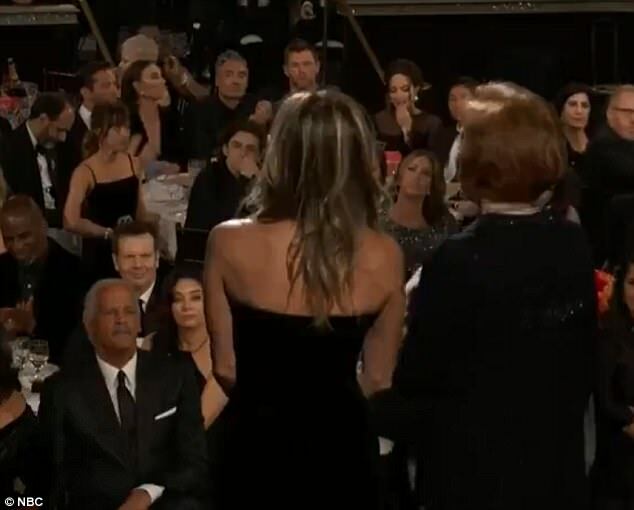 Pictures from Sunday night's Golden Globes appear to show Angelina Jolie looking uncomfortable while Jennifer Aniston presented an award onstage. 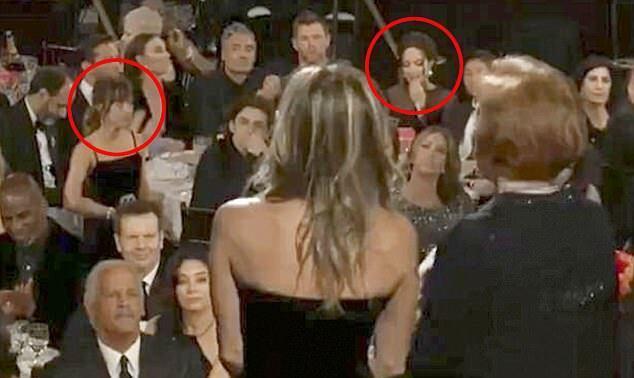 A shot taken from behind Aniston and Carol Burnett shows Jolie, who famously dated Brad Pitt immediately after the Friends star, studiously avoiding the stage and looking down at the table instead. 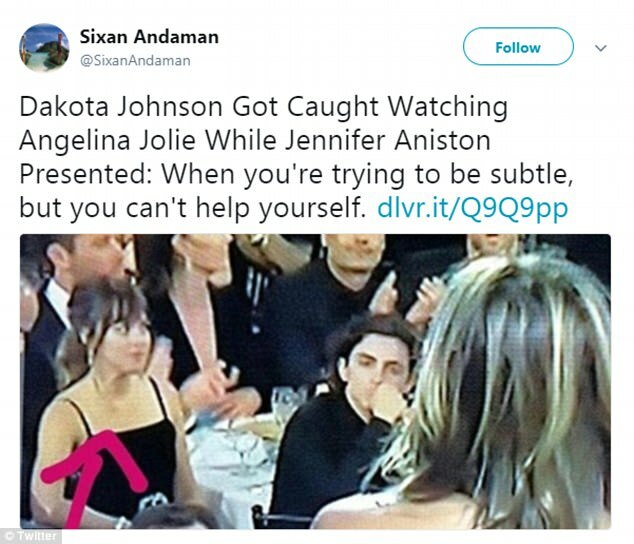 Only adding to the awkwardness, the same shot also shows Fifty Shades of Grey star Dakota Johnson sneaking a peek at Oscar-winner Jolie seemingly ignoring Aniston during the ceremony. The rest of the ceremony didn't allow for any awkward encounters as the actresses were seated on opposite sides of the ballroom. 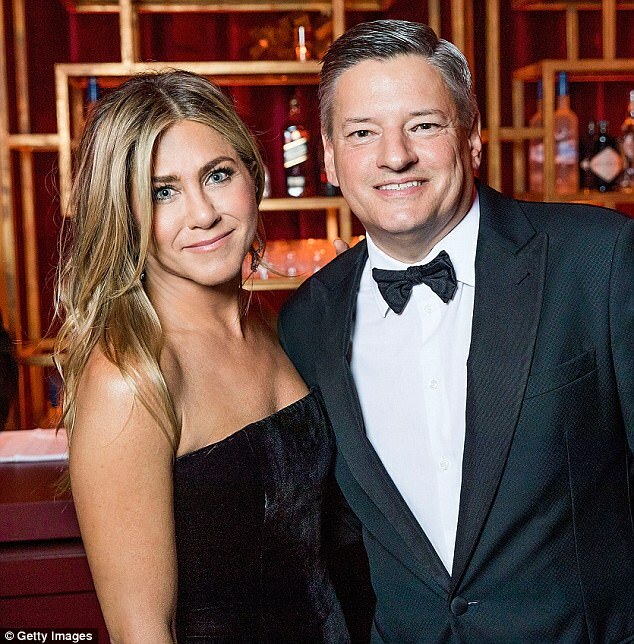 Aniston is thought to have skipped the red carpet in a bid to avoid running into Jolie - but the pair risked a face-to-face as they both attended the same Netflix afterparty. The pair haven't been in the same room since the Critics’ Choice Awards in 2015 - ten years after Pitt reportedly ended things with Aniston to start dating Jolie. Some viewers took to Twitter to speculate about the awkward moment between the two actresses at the Golden Gloves. One user hammered the point home by tweeting the image along with big pink arrows, identifying who's who in the picture. 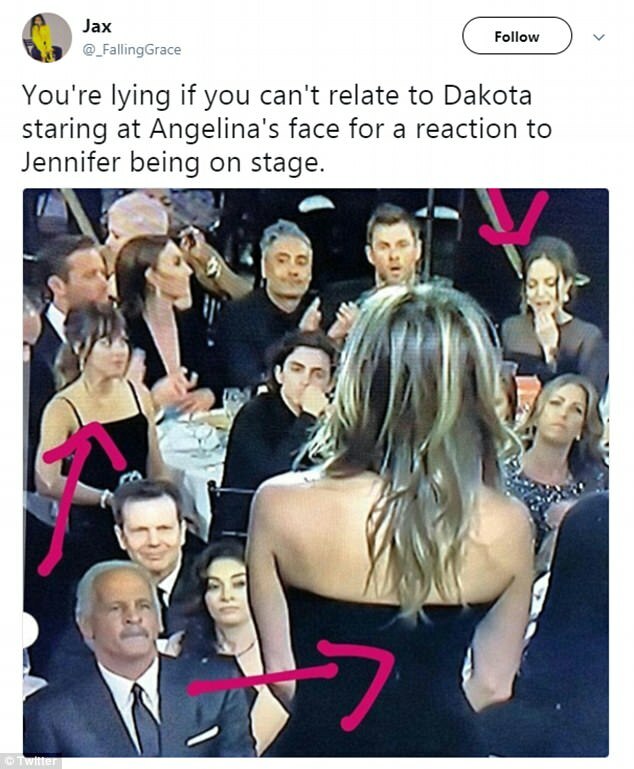 'You're lying if you can't relate to Dakota staring at Angelina's face for a reaction to Jennifer being on stage,' they tweeted. Other Twitter users soon started re-tweeting the post and acknowledging the awkwardness in their own comments. 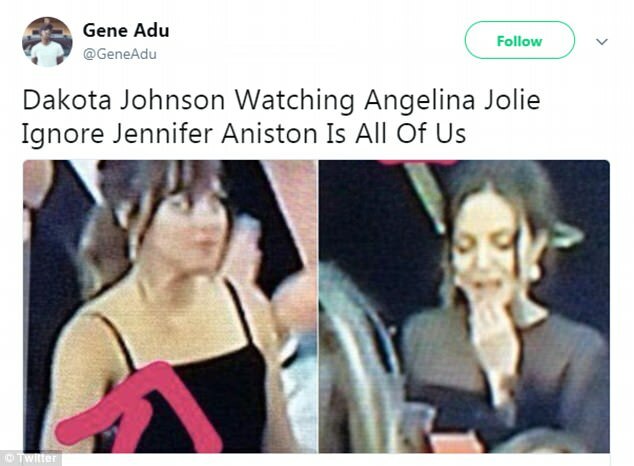 'Dakota Johnson got caught watching Angelina Jolie while Jennifer Aniston presented: When you're trying to be subtle, but you can't help yourself,' tweeted another. However, video footage of the incident shows it wasn't a snub on Jolie's part - but rather, a screenshot taken at an unfortunate moment. Both actresses have been married to Brad Pitt - Aniston, 48, from 2000 to 2005 and Jolie, 42, from 2014 until last year. It's been claimed that Jolie 'stole' Pitt away from Aniston while making the movie Mr & Mrs Smith in 2005, but other reports suggest that Pitt and Aniston were already on the outs when he met Jolie. In an interview with Vogue in 2007, Jolie maintained she and Pitt remained friends for a long time, and only embarked on romance after his divorce from Aniston. 'Because of the film we ended up being brought together to do all these crazy things, and I think we found this strange friendship and partnership that kind of just suddenly happened,' she said. The following year, Aniston addressed these comments in her own cover interview - and branded them 'inappropriate'. Jolie and Pitt began dating after his split with Aniston but they didn't marry until 2014. The pair have six children - Maddox, Pax, Zahara, Shiloh, Knox and Vivienne. The couple separated after an incident on a private jet and she filed for divorce in September 2016 after 11 years together. Meanwhile, Aniston married Justin Theroux n a top-secret ceremony at their Bel Air home in 2015. 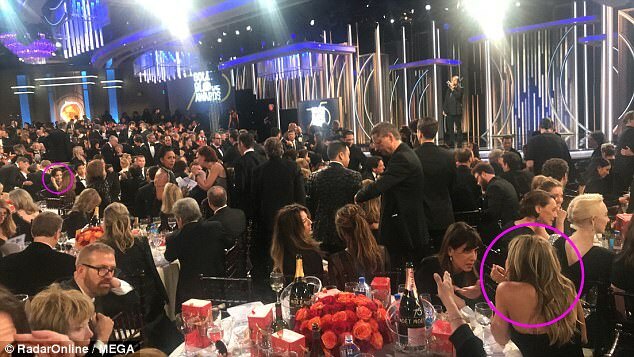 While both women attended the Golden Globes at the Beverly Hilton in LA, the former Friends star skipped the red carpet. But Jolie did pose for photographs in a sleek black gown, complete with mesh and feather-lined sleeves, with her son Pax, 14. They each also attended the Netflix afterparty, but were not photographed together or spotted running into each other. Both Aniston and Jolie were at the first big Hollywood awards show of the season to present trophies. 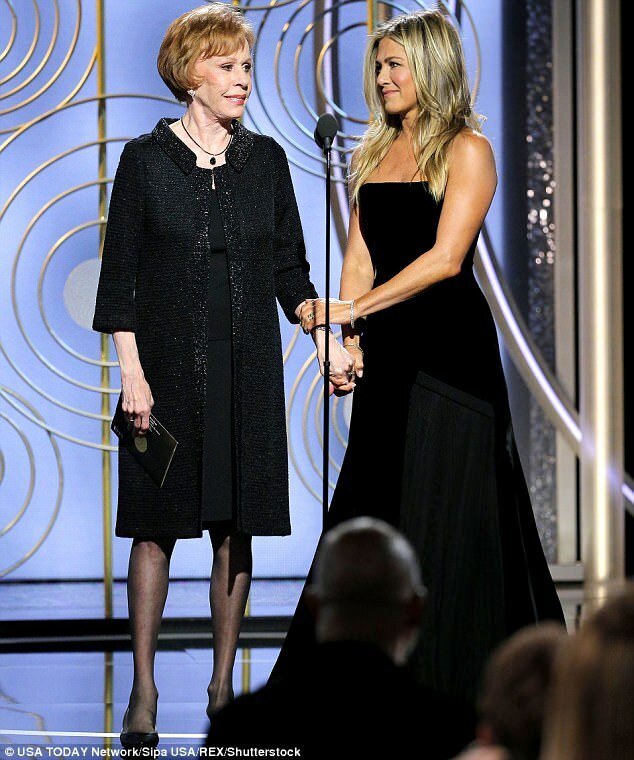 Aniston joined legendary star Carol Burnett to hand out the award for Best Performance by an Actress in a Television Series - Musical or Comedy, won by Rachel Brosnahan for The Marvelous Mrs. Maisel. Meanwhile, Jolie joined French actress and Golden Globe winner Isabelle Huppert to present the gong for Best Actress in a Motion Picture, Drama - awarded to Frances McDormand for Three Billboards Outside Ebbing, Missouri.